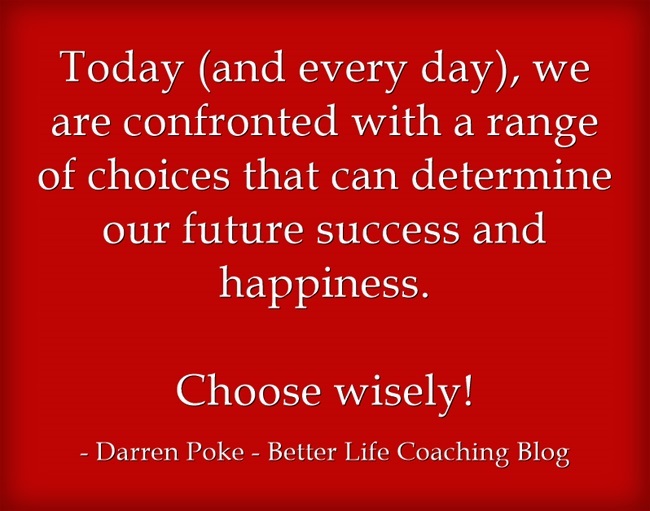 Today (and every day), we are confronted with a range of choices that can determine our future success and happiness. Run towards your goals, don’t dawdle aimlessly. Be excessively encouraging, not excessively critical. Be passionate and enthusiastic, not aloof and cynical. Read, don’t watch too much TV. Look to the future with hope and anticipation, not fear and trepidation. Do something that you will be grateful for in the days ahead, not something that you will regret. Find something to be grateful for, not something to grumble about. Live a life of purpose and meaning, not one full of trivial activities. Give more than you expect to get. Bounce back from disappointment, don’t let it define you or keep you down for too long. Be one who influences others to live great lives, don’t be influenced by the mediocre and average. And through it all, don’t forget to act in love, don’t wish that you did.